You do not need to make a purchase to enter or win. Winner will be notified by e-mail at the address provided at the time of entry. So make sure your information is correctly entered. Prize is not transferable, assignable, or redeemable for cash. You can not find substitution for the prize if you are the lucky winner. All Federal, state and local tax liabilities, if any, are the responsibility of the winner. PC/Notebook usability rating: 4/5. It takes about 5 minutes to finish with 2 open questions. Your receipt is needed. Tablet usability rating: 3/5. No mobile page for Tablet. There are 2 open questions and you need to enter your personal information. Smartphone usability rating: 3/5. No mobile page for smartphones. You can still finish Regal Entertainment Group Guest Satisfaction Survey via smartphone, but it may take more than 5 minutes to finish. Online entry. If you want to enter online, beginning on April, you can enter via Internet by logging on to the entry site. Mail-in entry. If you want to enter by mail, you need to hand print your contact information on a postcard only and mail the completed postcard entry to Regal Entertainment Group, 7132 Regal Lane, Knoxville, TN 37918. For more information about mail-in entry, read the official rules link below. 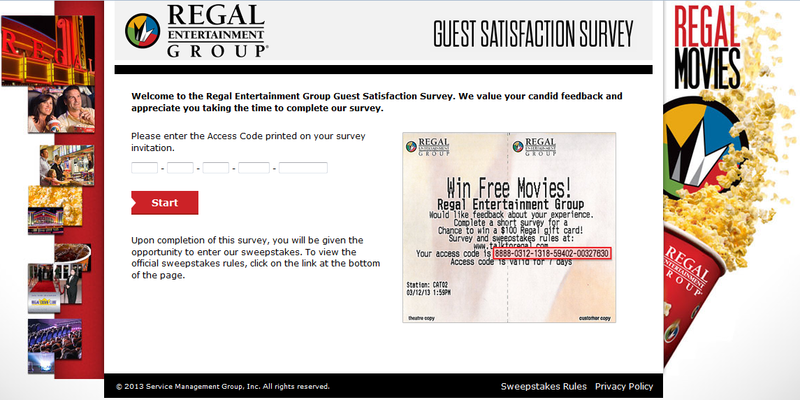 Visit Regal Entertainment Group guest satisfaction survey official website. Enter Access Code, Station Number, select date and time of your visit that can be found on your receipt. Rate your overall satisfaction with your experience at this Regal Cinema. Select answers to questions like "How did you purchase your tickets? ""Did you visit the restroom? ", etc..
Rate your satisfaction with statements like "The picture quality of your movie", "The sound quality of your movie", etc. based on your visit. Select the likelihood that you will return to this Regal Cinema in the next 3 months, recommend this Regal Cinema to others in the next 3 months. Answer the open question about the reason that you were satisfied or not satisfied with your experience at this regal Cinema. Select answers to a few more questions like "Did a team member provide information about how to join the Regal Crown Club? ", etc.. Fill out your contact information like your name email address, etc.. 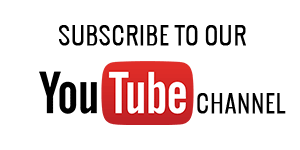 If you have any problem or difficulty to finish Regal Entertainment Group online customer satisfaction survey, refer to the following survey video recorded by Survebag editorial team. You can also find those related questions and answers related to Regal Entertainment Group customer survey in this article. Do you go to Regal a lot? Do you know that you actually earn rewards from Regal every time for just going the movies if you are a Regal Crown Club member? You can earn free popcorns, soft drinks, movies and more. That is so cool. Hurry up to pick up a new card at your local Regal theater. If you have any questions with Regal Entertaiment Group guest survey, like sweepstakes rules, winner list, how to enter, leave your comments and Surveybag will help you on that. Well, I tried to take your survey, but the web site and the access code did not work. Do you really want feedback? There are some people in attendance with us who are extremely rude with their cell phones and tablets turned on during the movie. The LED lights from their cells and tablets give the appearance of a flock of fireflies. This is occurring with middle aged people, not teenagers. Why can't the theater block their signals? Very unpleasant condition. I really like it there! i really love going to regal. Like the variety of theatres and their different offerings at a range of prices. I just really like the smiles. Happy employee's make happy customers. i really love going to regal!!!!! Good show and very comortable seats and very clean. Nice cinema and very good service. Always impressed with the inside appearance of the Division Regal. This also includes the "powder rooms". Everyone is friendly and I joke with them. Their response is a big smile. I noticed you hired a wheelchair bound man. I saw him being trained and he was very good. My next visit I saw him walking without the chair. I didn't ask, that's too personal. So, hooray to Regal and the Manager for hiring a disabled person. I'm proud of you Regal. And last, I like the coupons that print out by using my Real card. It's fun to receive a reward for long-term patronage. And I LOVE movies!!! I like the selection of movies showcased; more independent films and foreign films. Also I like the senior discount. The movies theatre is a little old in regard to amenities but it does work quite well and conveniently located behind the Stonestown Mall in S.F. Going to the movies at Regal in Boise is always a great experience. People are nice enough, and try to be helpful. But the answers I often want they just don't know. Movie was great, theatre was great, employees great. Good movies, sound system and comfortable seats. Saw "Divergent" on 4/15/14. Great service and clean theater. The movie theater is always clean. Restrooms are close to the theater. Its always a great experience. employees are kind and welcoming. clean theaters friendly employees good bargains. My husband and I enjoy going to Hunt Valley Regal. The people that work there are friendly and helpful. The theater always looks clean. We enjoy going to the movies and your theater is a favorite. We use the Regal card and partake in getting free movies/food and a discount on food. Would like to have a senior day when prices are even lower for seniors. It could be on a Monday and last until 6:00.